Tombstone is a band with a tragedy behind them, one of their band members died five years ago, and since then they have been driven to become doom metal masters for a new age. This is apparent in everything they do and falling into the void that is their new record Red Skies and Dead Eyes it is easy to see the soul capturing magic of a band who seem destined to succeed. 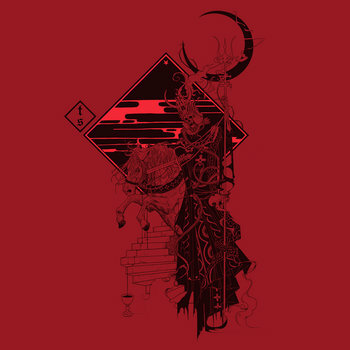 Their stunning grooves and captivating rhythms bring your soul into a strange world of complete oblivion, pure ascension and physical release through doom metal madness. These Norwegians have tapped into something very beautiful and primal with Red Skies and Dead Eyes, something that speaks to the soul. As a band who have such darkness behind their music, it makes tracks like King of Daze or The Other Eye all the more poignant. The bottom end of all of these tracks is fuzzy and powerful, reminiscent almost of Black Sabbath at times, or even Pallbearer. Tombstones get what it means to play doom, and the rock and roll vibe that they inject some of their more up-tempo songs with only helps to keep things interesting. These guys have a distinct flavor when they play and it helps bring the entire record to a new level. Find your way into antediluvian grooves, fall into a strange world of black moons and demon caves. Otherworldly vocals layer into a sound that has an incredible depth to it, the sort of thing that speaks to humans on a much more fundamental level. Really, what more could you ask for from a band who seem dedicated to honoring their fallen comrade? Red Skies and Dead Eyes is perhaps one of the most overlooked records of 2013, but as Tombstones evolve and put out new material am sure they will get the recognition they deserve.